When it comes to bays and bow windows, sleekness and style are key factors. Whether you prefer the expanded view of a bay window, or the supple curve of a bow window, both of these styles can dramatically open up a room. 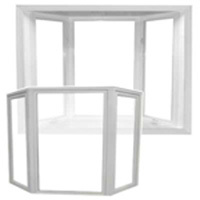 Traditionally, the bay window is made from three windows: a large picture window in the center and two smaller flanking windows on each side. The bow window features a series of five or more windows joined to form an arc or bow shape. Both styles come with an optional seat and head, available in different wood species. STANDARD SERIES SPECIFICATIONS: 3 ¼” Pultruded Fiberglass Frame completely filled with laser die cut Polystyrene, injection molded reinforced mitered corners with Polyurethane foam fill and sealed with silicone sealant. SIZES AVAILABLE:Most sizes and configurations are available. Fibertec manufacturers to sizes specified ½+/- 1/8″ (3.17 mm) industry tolerance. STANDARD BAY: Three 3 ¼” Fiberglass lites joined at either a 30 or 45 degree angle (other angles can be specified). STANDARD BOW: Five 3 ¼” Fiberglass lites joined at either a 10 or 15 degree angle (other angles can be specified). WEATHER STRIPPING:The three seal design conforms to the rain screen principle. A combination of flexible Santoprene bubble and fin for the main frame, along with pile fin on the sash. The weather-stripping is replaceable. BAY AND BOW FINISHING OPTIONS:Interior connectors available in fiberglass or oak veneer. Exterior connectors available in aluminum. Bay or Bow window assembly option can come with, fir, oak laminated, maple laminated, or poplar laminated plywood seat and header and side jamb build outs (boxed). When ordering, please specify: overall width and height (including seat & head if ordering), side window flanker widths, and over all or inside projections.